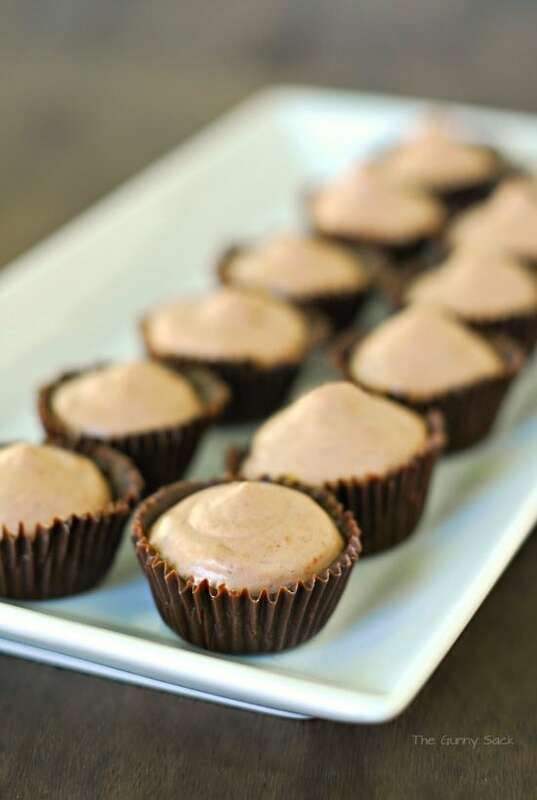 Nutella Mousse Cups are bite sized desserts that are perfect for parties. They have a chocolate shell and are filled with Nutella Mousse. I first heard about Nutella from my neighbors when I was a kid. I was friends with one of their kids and her parents were from Germany. Her grandparents still lived in Germany and they would send German chocolate and Nutella to my friend. I was so impressed that they got to put Nutella on toast and eat it like peanut butter! Now, Nutella is a staple in our house but I am most likely to use it in desserts. 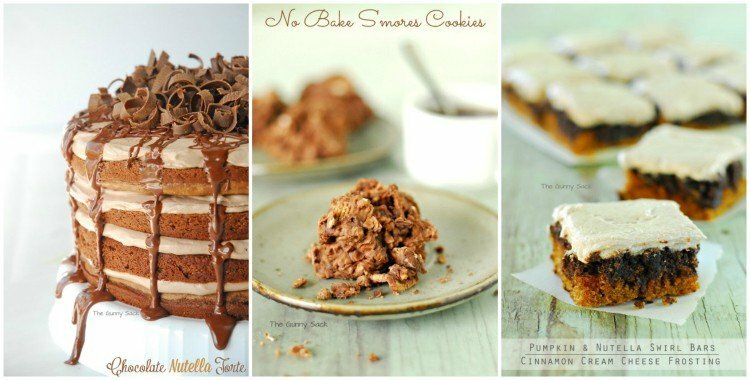 I try to share the desserts I make with family or friends or put the dessert into the freezer. This time I made individual sized Nutella Mousse Cups. They are easy to store and fun to serve! Using a cold bowl and a cold beaters (I put mine in the freezer for 20 minutes before using them), beat 1 cup of heavy whipping cream until peaks form. Gently fold in 1/2 cup of Nutella. Melt chocolate candy coating (I used CandiQuik) in microwave. 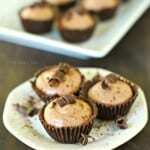 Coat the inside of mini foil muffin cups with melted chocolate. Allow it to harden before adding a second coat. Fill a pastry bag with the Nutella Mousse and the fill the chocolate cups. Carefully peel off the foil and place the Nutella Mousse Cups on a tray. Add a chocolate curl and a sprinkle of cocoa for garnish. I stored these Nutella Mousse Cups in the freezer. Other than the chocolate curl being pressed into the mousse a bit, it worked great. The chocolate curl could be added once the Nutella Mousse Cups have been thawed. Using a cold bowl and cold beaters, beat 1 cup of whipping cream until stiff peaks form. Gently fold in 1/2 cup of Nutella. Place in the fridge until ready to use. Melt chocolate candy coating in microwave. Coat the inside of mini foil muffin cups with melted chocolate. Allow it to harden before adding a second coat. Fill a pastry bag with the Nutella mousse and fill the chocolate cups. Love Nutella as much as I do? Here are a few more recipes to check out. How many does this make? I am going to a party and would like to make about 25-40 of them so not sure. I am also going to buy the chocolate cups rather than make them. What a fantastic idea, I make Nutella Mousse quite a lot but normally serve it in Champagne flutes. I am going to try making these at the weekend!! When I make the mousse I add a teaspoon of instant decaff coffee granules (my mum can’t drink caffeine) to the whipping cream and put in the fridge for 5 minutes to allow them to dissolve just before adding the Nutella. You can’t taste too much coffee but it really brings out the flavour of the hazelnut! everything seems delicious, I will bake this cake this weekend. I was able to make about 30. Thanks for stopping by! These look delicious! I’m tempted to make them for my sister’s wedding but I’d have to make them several days ahead of time. I want to make sure I don’t mess them up by prepping too early. You mention you store them in the freezer – any advice on if they would hold up or how to properly thaw them? I haven’t made these very often, but yes, I did store the extras in the freezer for a few days and they tasted great. Like I mentioned, the chocolate curls could be added after they thawed. I don’t have any great advice, but I would suggest that you made a small batch to see how they hold up. Best of luck and congratulations to your sister! These look delicious! I was just wondering how exactly you coated the foil liners with the chocolate. Thanks for your help! 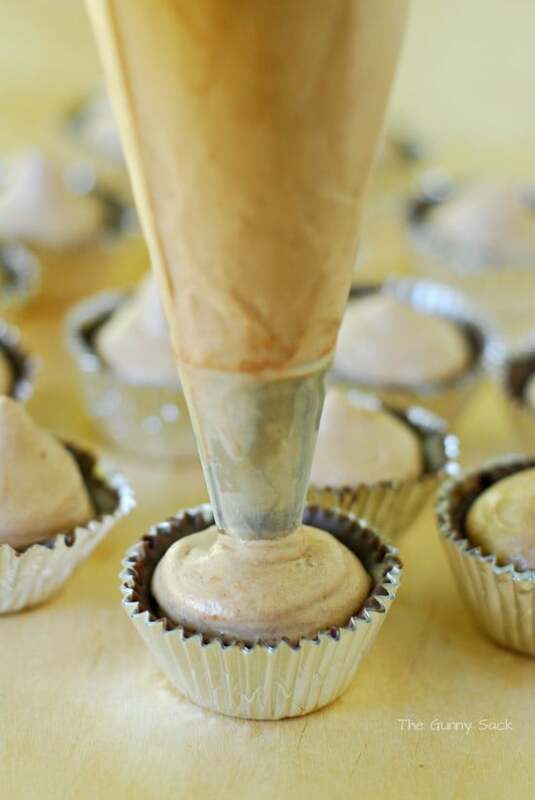 I have pictures of how to coat the foil liners in my post for Chocolate Biscoff Cups. 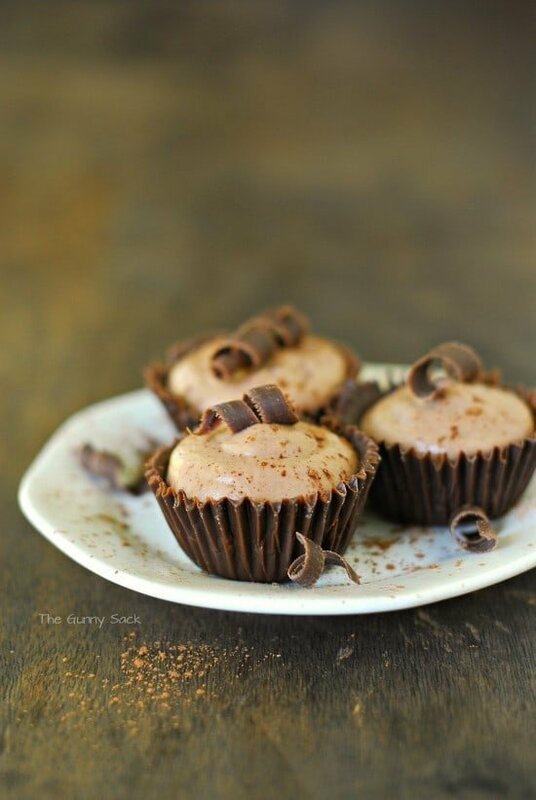 https://www.thegunnysack.com/2013/08/chocolate-biscoff-cups-recipe.html Thanks for stopping by! Just made these for a potluck tomorrow. Man are they ever delicious!! Can they be refrigerated overnight or should I freeze them? Wonderful! I’m so happy they turned out. I would just refrigerate them overnight. Have fun tomorrow! Oh yea, big Nutella fan here! These sound aweome! What perfect little bites of Nutella heaven! Pinned! Wow. These little cups looks amazing. I WANT ONE NOW!!!! I am a huge Nutella fan! These look delicious and like the perfect size! I need to try Nutella! Couple questions… is there a reason you would have to use foil cups or would paper liners work? Do you think white bark would taste as good? I’m hoping to use what I have in my house. Thanks! I used the foil cups because I think the chocolate would stick to the paper liners and you wouldn’t be able to peel them off. But I’ve never tried it so it might work! I think the white bark would be delicious. Best of luck! Ok, so I made these. Oh. My. WORD! They were so good! Mine were not as pretty as yours. But also, something happening to my whipped cream when I added the Nutella. It got runny and kind of separated. Any idea what I did wrong? Maybe the cream was past its peak? Thanks! It might have been overmixed. The Nutella only needs to be gently stirred into the whipped cream rather than beat into it. I will update the instructions. I’m glad you enjoyed them anyway and thanks for letting me know. How about melting Nutella into whipping cream, chill the mixture and then whipping them? Oh my!!! You have done awesome things with this one!! By the way I had bread and Nutella for a snack yesterday! Thanks Nancy! My daughter loves Nutella on toast!